Qigong is a 7000 year old system of self-healing combining the energy work of Oriental medicine with meditation and physical movement. The effectiveness of Qigong has been proven by its beneficial impact on the health of millions of people over thousands of years. In 1992 Zhineng Qigong was declared the most effective method for preventing illness and maintainghealth - more so than any form of Tai qi or other exercise practiced in the entire territory of China. For most people, the first and foremost benefit of Qigong lies in helping to relieve stress and prevent chronic health problems. In China Qigong is used to help relieve a range of maladies such as diabetes, asthma, cancer, poor circulation, internal organ problems, arthritis, nerve pain, back issues, joint problems, hyper and hypotension, autoimmune disorders and general physical disease. Qigong -like Chinese Medicine- is based on the notion of "Qi" - natural energy - the life force. Qigong builds qi, and this energy can be used to heal injuries and illnesses, improve your general health or develop special abilities. 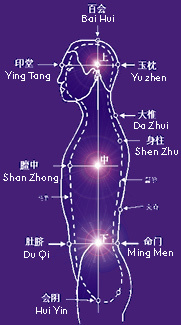 Chinese Medicine & Qigong treat the whole person; Western medicine generally treats the disease symptoms only. Qigong exercises are generally simpler and more specific than Tai qi, with particular techniques for particular health problems. Doctors in China and now Europe prescribe Qigong as therapy for high blood pressure, poor circulation, asthma, nervous diseases, impotence, arthritis and back, neck and joint problems. These exercises loosen the joints and make the spine stronger and more flexible. Qigong includes meditation techniques that are extremely effective for calming and stilling the mind, releasing stress and retarding the aging process. • Moderate the function of the glandular system, as well as the fluid of the brain and spinal cord, which mediates pain and mood, potentiating immune function. It has been proven* that daily and consistent practice of Zhineng Qigong can strengthen one’s overall health and mental state. Zhineng Qigong includes simple meditation techniques that are extremelyeffective for calming and stilling the mind into focus, releasing stress and retarding the aging process. * Boosts the immune system (Prevention Magazine v. 42 May 90, p. 14-15+). * Slows the aging process (QiGong, The Art & Science of Chinese Energy Healing, Kenneth S. Cohen, NY, 1997). * Improves balance and coordination TWICE as effectively as other balance training (Prevention Magazine, v. 46 Dec. 94 p.71-72+ & USA Today, May 1996). * Improves postural control, while stretching, toning and relaxing the body in a cumulative way that no other exercise can achieve (American Journal of Occupational Therapy, 1992 Apr Vol 46 (4) 295-300. * Qigong is probably the lowest weight bearing exercise, and modified forms can be suitable even for arthritis sufferers (American Journal of Physical Medicine and Rehabilitation, June 1991, 70 (3) p 136-141. * Qigong has been recommended as an adjunct therapy for chronic pain, AIDS, arthritis, insomnia, asthma, high blood pressure, Parkinson's, Multiple Sclerosis, fibromyalgia, and any psychosomatic illness. * 70% OF ALL DOCTOR'S VISITS ARE DUE TO STRESS (Copyright, Stress Management & Relaxation Technology, 1997). *A Comprehensive Review of Health Benefits of Qigong and Tai Chi, (Copyright: Arizona State University College of Nursing and Healthcare Innovation | Phoenix, AZ 85004). "We cultivate our own life energy (qi) by accessing nature's great store of qi. This approach produces quick results. But cultivating one's qi is not the most fundamental; cultivating one's spirit is. Mastery of qi is really achieved through mastery of consciousness. We use consciousness in a careful, craftsman-like way, to shape our life, to attain our goals. If we use modern terminology to name this process, we call it qigong..." "…In modern terms, qigong is just the refinement of consciousness to enhance the state of energy in the body. This leads to vibrant health, a harmonious body and mind, and an awakened spiritual life.